Cozy up in Country Bears Cabin, a charming 2,000-square-foot 2-bedroom + loft, 2 ½-bathroom cabin in Pigeon Forge, Tennessee. 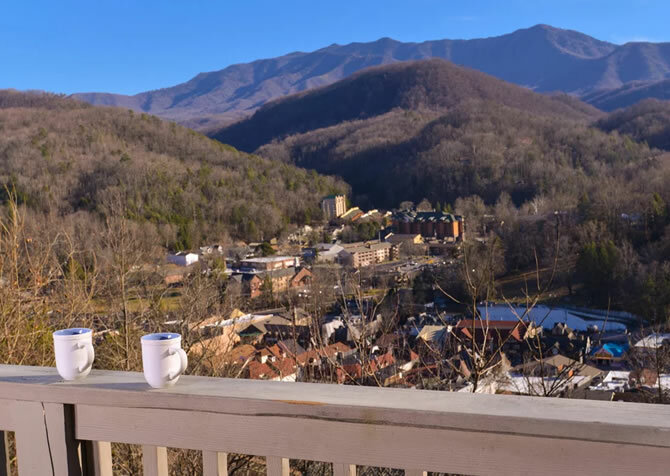 With space for up to 8 guests, this Smoky Mountain retreat is great for fun family vacations, a weekend away with friends, or a relaxing couples’ getaway! 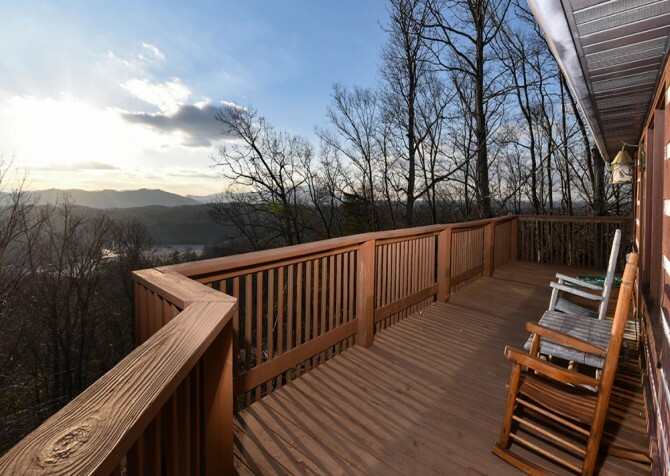 After exploring all the shops, attractions, and restaurants of Pigeon Forge and neighboring towns of Sevierville and Gatlinburg, this cozy cabin will be a welcome place to call home. 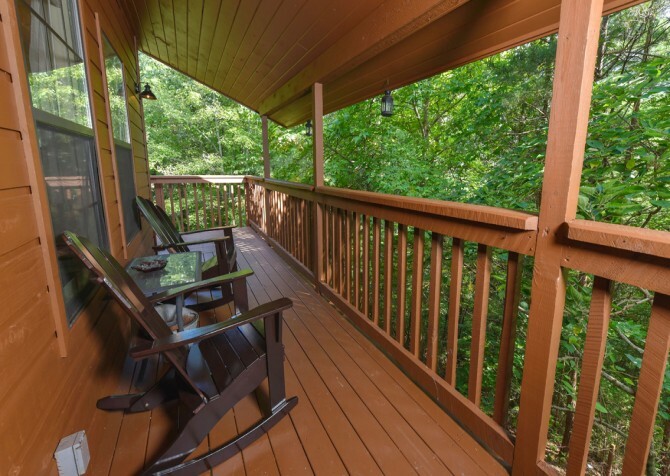 Wooded views await for peaceful days spent on the 2 levels of decks and around the cabin outside, where you can sit back with a drink in the rocking chairs, make s’mores and chat around the outdoor firepit, and unwind at the outdoor seating area with chimenea. The picnic-style charcoal grill is great for cookouts, and the outdoor hot tub is the place to soak away your stresses. 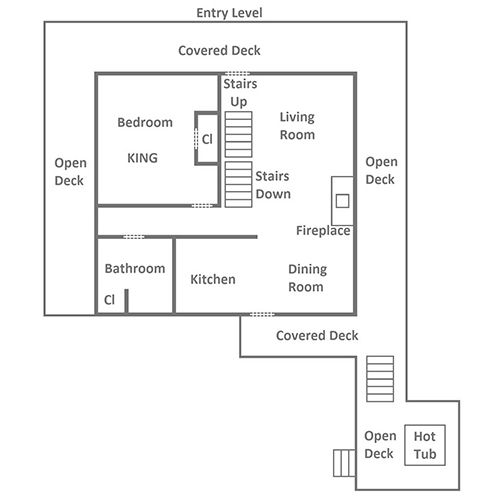 Then head inside for more relaxing space and convenient amenities! Inside this secluded cabin, cool mountain nights are spent by the wood-burning fireplace or soaking in the indoor jetted tub. Movie night gets an upgrade in the theater room with a big screen TV and Blu-ray player, and you can bring along your favorite DVDs and tapes for the VCR, too! Kids (and kids at heart) will love the Sega Classic, and the board games are a family game night must! 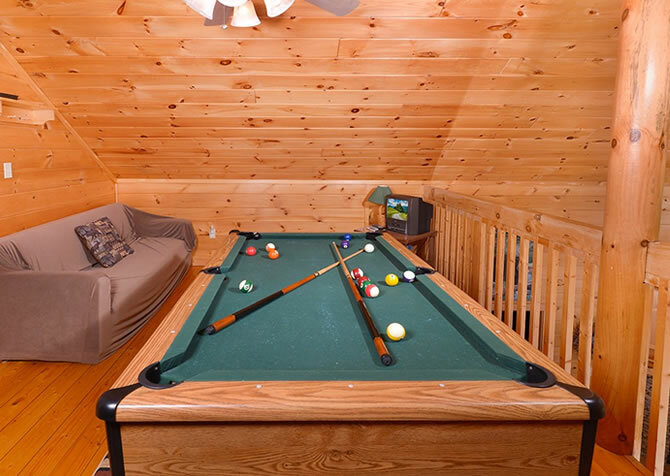 The cabin even has a pool table for more fun. 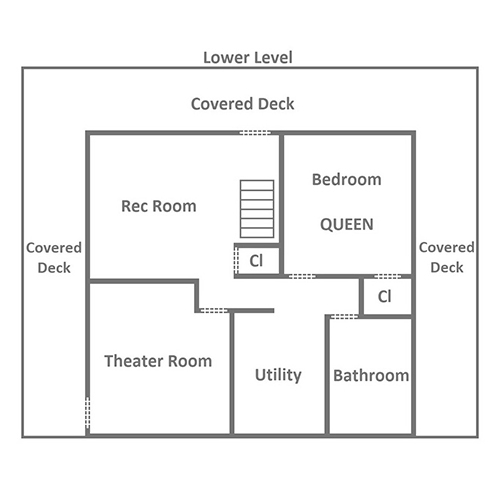 At the end of the day, retreat to sleeping spaces featuring 2 queen-size beds, 1 king-size bed, and a futon in the theater room. 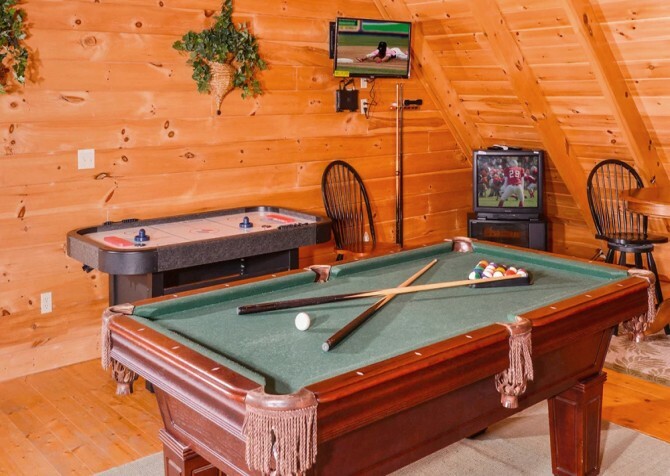 And with extra amenities like a CD player, wireless internet, TVs in the bedrooms, a fully equipped kitchen, and a washer and dryer, everyone is sure to stay comfortable and happy at Country Bears Cabin! Step inside the spacious, open-concept living area at Country Bears Cabin, complete with hardwood floors, eye-catching exposed beams, and a wood-burning fireplace. Snuggle up on the plump sofa with a good book next to a toasty fire on cool evenings or pop in your favorite DVD for movie night on the big screen TV with snacks piled high on the coffee table. There’s also a plush arm chair and cushioned glider for extra seating. The stylish ceiling fan keeps the area cool on summer days, and the large windows reveal enchanting wooded views year-round. Food is important on any vacation, and with a fully equipped kitchen at your private cabin, you can even save a little cash with every meal. Stainless-steel appliances complement the hardwood floors and wooden cabinetry in this space, and the bar area for 2 is a great place to stop for a cup of joe in the mornings. Store fresh ingredients in the fridge, whip up homemade dishes on the stove, pop everyone’s movie-night favorite in the microwave, brew pot after pot of coffee any time, and create your family-famous smoothie in a jiffy. Plus, with all the cooking utensils, pots and pans, mugs, dinnerware, and cutlery you’ll need provided, culinary creations are endless at Country Bears Cabin! Set the dining table for 4 for scrumptious meals throughout the day, with beautiful tree-studded views through the large windows all around. When everyone’s finished seconds and dessert, clear the space for board game fun with a few favorites provided, like Mancala. And if the games get too heated, switch on the ceiling fan above to keep things cool. Movies are extra special in the theater room at Country Bears Cabin, featuring a nice big screen TV and raised seating. Claim the futon down front all to yourself or share a seat with your friends on the plush sofa in the back. Grab bowls of parmesan-topped popcorn from the kitchen, set out drinks on the small table, pop in a Blu-ray disc, dim the lights, and press play! Looking for something more interactive? Head to the rec area nearby for a pool tournament of champions. There’s also a small table for 2, perfect for a game of cards or a cold one with a friend. Bedtime is crucial, and at Country Bears Cabin, each of the 2 bedrooms offers a TV for entertainment, a ceiling fan to keep cool, and reading lamps for your favorite novel series. One harbors a king-size bed, while the other boasts a queen-size bed. 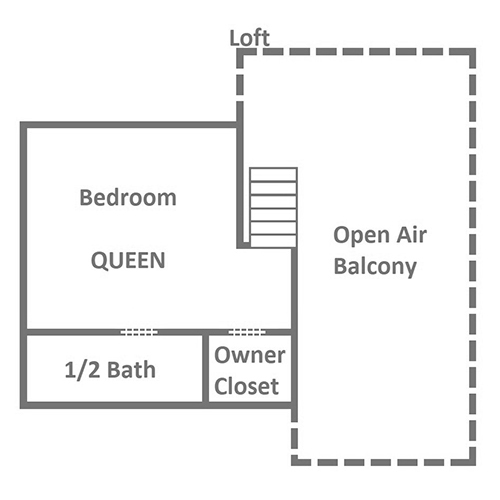 For extra sleeping arrangements, there’s also a queen-size bed in the loft and a futon in the theater room. Ah, and before you hit the hay, be sure to take a relaxing soak in the indoor jetted tub, which pairs perfect with scented candles and soothing tunes. 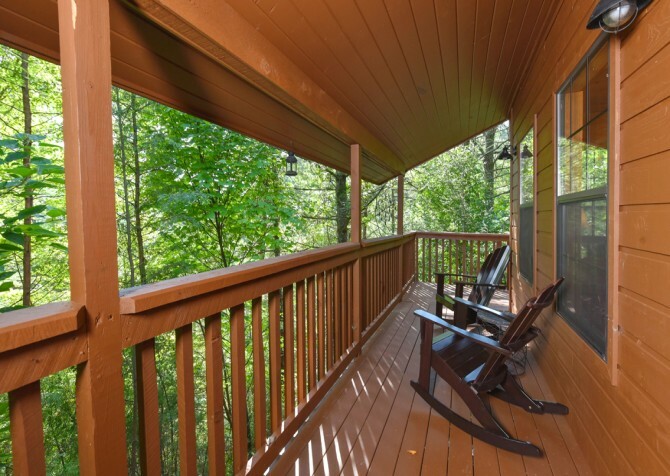 The great outdoors is where you’ll want to be at Country Bears Cabin, boasting a bubbly hot tub under the stars, a wraparound deck with rocking chairs and cushioned seating, and a large firepit area with a stone wall feature. Care to dine in nature? Enjoy meals at the outdoor dining table for 4 on the lower-level deck, featuring additional seating plus a cushioned porch swing. 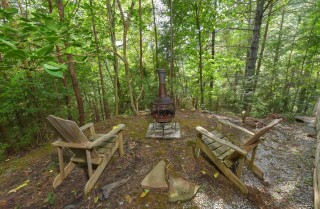 There’s also another outdoor seating area with a charming outdoor fireplace to keep warm on chilly evenings. 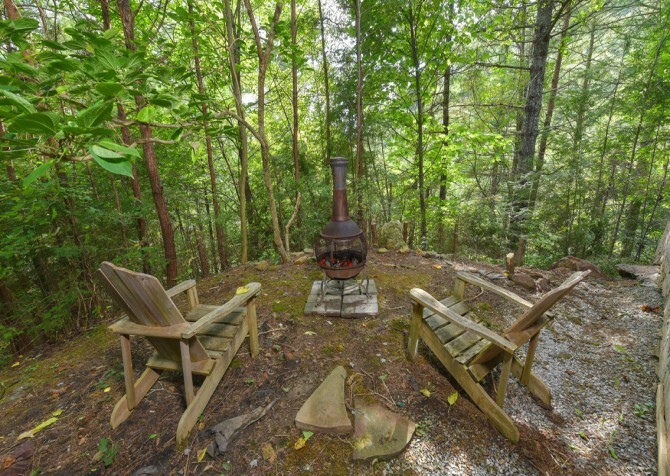 As soon as you pull up the steep, paved driveway with parking for 7-8 vehicles at this completely secluded cabin, you’ll feel instantly mesmerized by the tall, swaying trees all around. 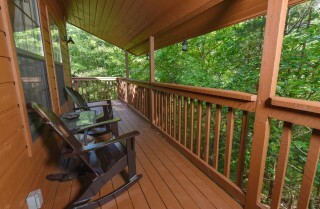 If privacy is what you seek, you’ll find it at Country Bears Cabin! Last but not least, you’ll also find a charcoal, picnic-style grill, perfect for barbecue parties or romantic steak dinners. You didn’t think that was all Country Bears Cabin had to offer, did you? No worries! There’s a washer and dryer to keep laundry fresh, complimentary Wi-Fi to keep up with the latest social trends, a VCR to watch family films, a CD player to get the dance party started, and a Sega Classic gaming console to play for hours on end. 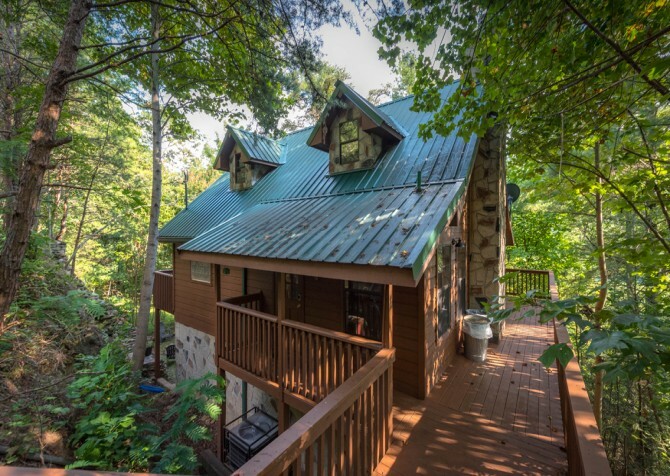 Around 10 miles to the heart of Pigeon Forge, Country Bears Cabin keeps you tucked away in the forest yet close enough to make it to your dinner show with time to spare! Thinking about going for a horseback ride through the mountains? Waldens Creek Stables is close by, offering trail rides, wagon rides, and group events. Ready for an exciting adventure through the trees up to 250-feet high? Head over to Wears Valley Zipline Adventures, featuring views of Mt. LeConte and the Great Smoky Mountains National Park! Bring home one, two, or ten souvenirs from Moonshine Ridge Country Store & Café, boasting homemade fudge, garden trinkets, and home décor.